AsiaSat 9, the most powerful member of the AsiaSat fleet, is fully operational at 122 degrees East following successful migration of all services from AsiaSat 4, delivering enhanced power, greater bandwidth and improved efficiency to customers for advanced DTH, TV distribution, VSAT broadband and mobility services across Asia-Pacific. Artistic rendition of the AsiaSat-9 satellite. 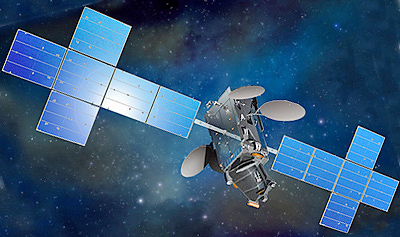 The new AsiaSat 9 features significant upgrades, including Asia’s highest powered 110 watt C-band amplifiers, special filter design, star tracker and hall-effect thrusters that generate higher efficiency, enhanced stability and reliability in network operations. In addition, AsiaSat 9 ’s three new Ku-band Myanmar , Indonesia and Mongolia beams, and two enhanced Ku-band beams serving Australasia and East Asia, provide high downlink power up to 55 dBW that allows use of small antennas for more cost effective rollout of customers’ networks. Andrew Jordan, the President and CEO of AsiaSat, said that the brand new AsiaSat 9 now carries the most powerful and widest C- band coverage and multiple dedicated Ku-band beams over key Asian markets at the company's prime orbital slot of 122 degrees East. Wth AsiaSat 9 ’s innovative features and significant enhancements in power and coverage, a positive step forward has been made to provide more cost efficient and higher quality services to customers, with even better entertainment, information and communication services across the region.